Welcome to Build-A-Flower Sweet Violet Release! I have a messy watercolour card to share with you today. I used Watercolour Brush Markers to colour the images today. The colours I used for the flower were Purple Wine, Persian Blue, and Turquoise Watercolour brush markers. For the leaves, I used Limeade, Lime and Emerald brush markers. For my background, I used the 36 pan watercolour set by matching the colours of the flowers. Altenew will also draw a winner to receive a $15 gift certificate from the comments left on each designer’s blog on the blog hop. All winners will be announced on the Altenew blogs on 4/9/2019. I love how you colored the flowers! :) They look awesome. What a beautiful mess,If you call it messy colouring!! Beautiful! Love the textures you create! Very pretty Erum, as always, Love the splattered look on the flowers. Just live your work...and jealous of how talented you are! Haha! Really lovely card Erum. Thank you. This is really beautiful and calming as an image. Love your card! I am new to watercoloring so seeing beautiful examples like yours gives me hope that one day mine will look beautiful too. Love your watercoloring! This set is a perfect stage for it! You make messy so appealing! Your card is so beautiful! Love your watercoloring!!! This is a gorgeous new flower set just perfect for spring! Thank you for the inspiration! I know one thing for sure, you never fail to inspire!! Love your take on this flower. You do it so much justice. Nicely done card for sure! I love violets! Wow, your "messy watercolor technique" is just stunning! I will definitely have to try that! Love your card! I should do more watercolor. Love your technique! So beautiful. The coloring on the flowers is awesome Erum! I love violets! The card is beautiful! Love the "messy watercolor card". It's beautiful. Erum, I like how the flowers are all speckled! The messiness of your card works or this sweet flower. Love your 'messy' water coloring technique... it made for one gorgeous card! Hi Erum, I love the color effects on the flowers. It makes them so real! another gorgeous card with this lovely new BAF! So pretty. I love violets and yours are awesome. Ha, who knew even messy can look so beautiful! Such a beautiful card using this new BAF set!! The violets are so lovely and the background matches so well. Beautiful card! Gorgeous violets! Love the messy look. So pretty and fresh! Amazing choice of colors!Love the messy look! Absolutely radiant! Love this coloring style! Such beautiful colors to illustrate this great stamp set. Love violets! I love your card. Very pretty colors. I love the speckled watercolor look on those violets. What a beautiful card you made! Thanks for sharing your cards and passion! Your work is always lovely. You are so talented! I love these intense colors...they make this card come alive! Beautiful artwork! The watercoloring is so beautiful on this card and the colors really make me think spring! Your water colouring is amazing. Love your blend of colours. Wow the 'messy look' looks great!! Your work is always so artistic and unique! These violets are perfect for spring! And nature doesn't make perfect flowers!!! I just knew you would have such a beautiful sample of these new sweet violets!! I really like the water colored violets, messy is SOOOO beautiful! Ah Erum, I love a loose, (better word than messy, don't you think? ), watercolour look & you've made it so well. Sweet card for a sweer little flower. Love your beautiful coloring of the violets. Fabulous card. ooooo I love the speckled splatter look! What a cool way to color! Love your watercoloring of this new BAF release and so loving the paired inks as well!! Your talents really show us the place where we can take it and always your fan!! If only my messes looked anything like yours! Stunning. Such a gorgeous mess of beauty! Wow, love that you used watercolours to showcase the violets. What inspiration you provided. Thank you so much for sharing your talents and showing an absolutely amazing card. Your cards are lovely, not messy at all! So pretty. I just love this new stamp/die set. I love how you used the colors to make the flowers look so real. Just plain gorgeous!!!!!! Erum, you always share the most vibrant and super pretty cards. I love your color combinations...thank you so much for sharing this pretty sample. Lovely card. Love the messy watercolor style. I'll have to try it. Gorgeous card,love this technique so much. Violets are such pretty flowers. Stunning! I can't wait to try this technique! These are one of my favorite flowers and I’m a sucker for the purple!!! Erum, this is absolutely stunning! LOVE your messy watercolor - do you happen to have a video showing your technique? I really love the speckles and am wondering how you achieve that look. Thank you for sharing your talent. A beautiful card. Wish I could do better with watercolors. Your technique makes the stamping look so original. Lovely! My favorite company fir flowers and dies is Altenew! I'd love to know how you created your messy--not messy water coloring. All the different colored dots really add a nice texture to the flowers. 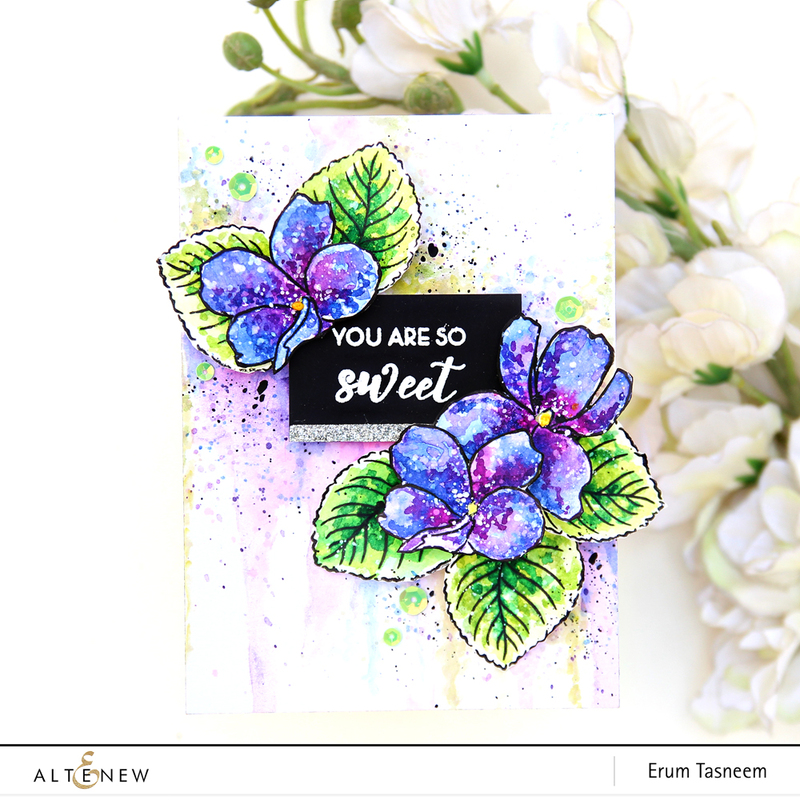 GORGEOUS violet card, and your water coloring is so pretty on the flowers and the background, LOVE the messy water color style and the splatter. This is my favorite kind of water coloring. Gorgeous! Love the colors you used! Violets are such sweet flowers, and happen to be one of my favorites! Violets are my favorite flowers ever!! Cannot wait to get the set and hopefully do some projects half as nice as these! You are the speckled art queen! Such gorgeous artwork in every card! Beautiful card, love your technique! I love this technique. Very pretty. I love this technique. The card is lovely. 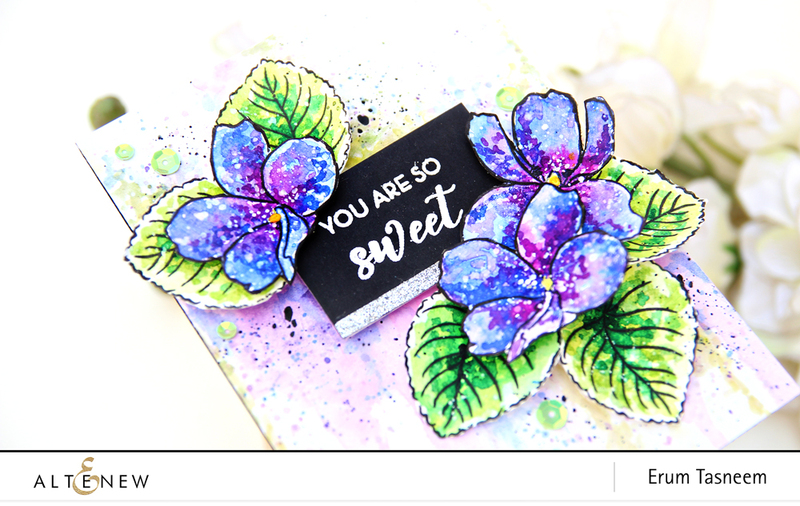 Beautiful messy watercolored sweet violet card! Another lovely BAF set! 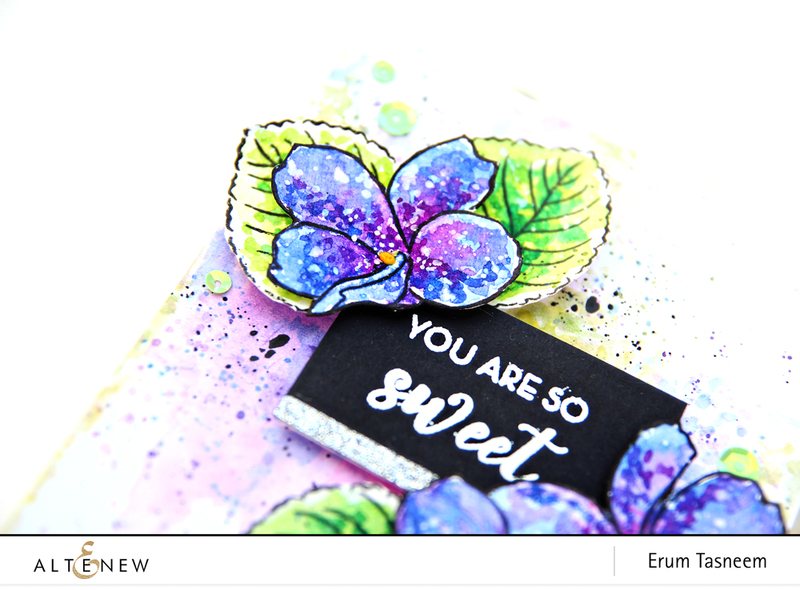 Thanks for the inspiration Erum, your card is gorgeous, love the look of texture the coloring adds to the flowers! Very artistic. Love this beautiful mess! What an inspiration your card is; love the techniques you used in coloring your flowers. Beautiful card! just luv this look! you're always an inspiration! the speckled look is pretty! I love the messy look! Gorgeous colors and beautiful stamp set! Another great bloom, love this set and your beautiful work! Love the multi-colored violets! So pretty. LOVE your watercolouring ... the design has a MAGICAL touch that is so BEAUTIFUL! Beautiful card. Thanks for sharing your time and talent with us. This is SUCH a beautiful card. I love how you used the splatters all over the flower, and I particularly love the colours you chose for the leaves. So lovely. Wow!! Wow! Wow!! Your card is just stunning Erum! I love your watercolour look on these gorgeous violets! I'll really have to practice! Thanks so much for sharing and for your wonderful inspiration! Wow! Absolutely stunning! This is my favourite card in the entire hop! You really do the messy look so well! Mine always ends up looking like a hot mess! I love your color palette for your flowers! Thank you for sharing your technique with us! Love this. Truly stunning! Happy celebrating. I just LOVE Altenew. Beautiful - I love the gorgeous texture in your flowers. Gorgeous. I love your coloring (I must get those watercolor markers!). The Sweet Violet set is so beautiful. The colors on these gorgeous florals are absolutely stunning! You are a true artist! Love your messy watercolor look. And the colors are amazing! Thanks for the inspiration! So pretty--love your watercoloring technique. Beautiful! Fun! And so colorful! Thank you. Such a great use of color. I do enjoy the messy watercoloring. It shows me that even though I'm not very good with paints I can still create something wonderful. Great card! I love that beautiful purple messy look!! Your card is beautiful!! I love that you used the Watercolor Brushes, they are my favorite!! Such a fabulous card! Amazing!